The American's with Disabilities Act (ADA) is supposed to guarantee that anyone can have reasonable access to most if not all places around town (among other important things). Unfortunately, movie theaters - home to the universal language that is cinema - haven't caught on completely. Sure, there are ramps and handicapped seating, but even those can be abused and paid lip service to. And what of enjoying the film itself? Are on-screen captions or descriptive audio devices easily requested? - Cat, you recently did some research on accessible and inclusive screenings and tech availability at movie theaters in the city and surrounding area. What did you discover? Did you get any negative pushback from anyone? I remember deciding that I must try it myself, so I started cold-calling theaters around the greater New Orleans area. I never received an outright negative reaction from any theaters, but I called about eight theaters between the North Shore and the West Bank and only three could give me definitive answers. The AMC in Elmwood put me on and off of hold for over twenty minutes and then hung up on me Regal Cinemas in Covington provide the new Sony closed caption glasses where the captions are projected directly in front of your eyes and the Theaters at Canal Place offer the closed caption devices that stick in viewers cup holders and display the captions via a small screen. Overall the experience was ostracizing from the rest of the audience and really separated me as a viewer from the film. The glasses were the least obtrusive spatially, but the captions were so bright and close to my face it was uncomfortable to read. I also get motion sickness quite easily and the glasses really didn’t bode well with that, the subtitles and film were moving at different rates and created a disorienting experience. The next, more widely used device the “Captiview” was a different sort of awful. The first problem I encountered was that the device took up the entire cup holder - if you’re in a row full of people (like I was that day) you can’t just take up two cup holders. The Captiviews captions lagged the entire film and the “adjustable” neck of the device was weak it wouldn’t stay in position which caused me to twist my neck around to try to read the captions. In the end, I just completely abandoned the device. - Since opening, what has the demand been like for more accessible showings (sensory friendly, open captions, audio descriptions, etc)? Michael Domangue (MD): Demand has been light but consistent. When opening the theater we knew that certain accessibility options would not be available to us at the beginning but we worked hard to go above and beyond ADA standards to make it easy for everyone to come to the theater. Now that we have two years under our belt we are looking at reaching those we haven't yet before. - What happens at an open captions event? Is the technology to provide these screenings available for all movies, or just from a few studios? MD: The only difference with an open caption screening is all the dialog and some descriptive events are printed on the screen. The audio is played at the same level as any other screening. 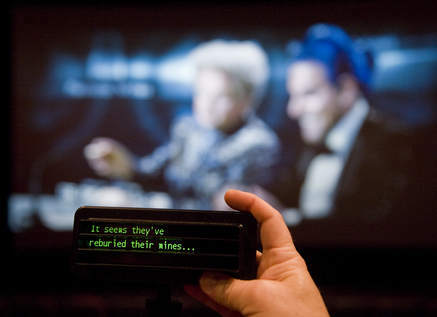 All major releases by the big studios send theaters a closed caption and open caption version of the film on the same drive. The amount of technical work it took for us to do this screening took less than 30 minutes. I will say that incorporating portable captioning devices, which is our end goal is much more technically involved and will require retrofitting all of our screens with new equipment. We do not have a solid timetable for getting this in place, but sometime this year is not an impossible goal for us to reach. - As it relates to Hollywood and the cinema, how far have we come since the ADA passed and how much farther do we have to go? Are movies, indeed, a universal language? Mary Kim Hoang (MK): Although we’ve come far since ADA was first signed into law in 1990, we still have a long way to go! Right now it seems like most places are doing the minimum required by law, which in all reality isn’t enough in many cases. CP: I believe that like music, the visual language of cinema is universal. I can’t tell you how many times I’ve stopped paying attention to captions of foreign films because the visuals were not only striking; but because of the combination of amazing performances, moving soundtrack, and masterful use of that visual language. This perfect combination should create the groundwork for a beautifully told story, that dialogue can only enhance. Dialogue is a vital part of cinema, but in my mind, it should always take the backseat. A character’s goals, motives, and truth should lie within their action - not verbal exposition. Concerning ADA, I’m not extremely well versed; but it is my understanding that theaters are really behind the times and not inclusive to Deaf or blind audience members. Our goal as a production is to not only create a film that can be enjoyed by any audience member but partner with local businesses - like the Broad Theater- and organizations in order to create spaces where all films can be enjoyed. - How has A Quiet Place been doing? Where does it rank among recent progressive cinema, like Black Panther? MD: A Quiet Place is one of those rare films that has been increasing in demand as the week goes on. Word of mouth is very strong for the film and we are moving it to our largest screen for its second week, which is also a very rare thing for us to do. - When I went to see It last year at an AMC, I sat next to a blind man who depended on his friends to describe the action on screen. What experiences have either of you had with big chain multiplexes providing/not providing assistance? CP: My only experiences using or trying to find chains with captioning devices was when I was doing my research. After using both options, neither of them were really comfortable and it became clear why we don’t see more Deaf audience members at chain megaplexes. I know I want my films to be seen by the widest possible audience. I love film and I love seeing them in theaters — I think everyone deserves that right. Every day there is a new article mourning the death of cinemas and how average movie going is no more. How do chains attempt to fix this? By adding fancy bars, luxurious lounge chairs, and 4DX shaking chairs blah, blah blah. Why not appeal to members of your audience that are dying to see movies in theaters? Offer open caption screenings and invest in audio assistive software for blind audience members. - You've often said that, as a team, The Broad bends over backward for all moviegoers. Has the theater faced any challenges or frustrations in building such a universal environment? MD: I think the biggest challenge has always been and will always be providing a mix of films that satisfy as many people in our community as possible. It means playing Blockbusters, documentaries, foreign films, the latest Tyler Perry film, and awesome horror movies like A Quiet Place. There are those who just want us to be an arthouse theater or a mainstream theater and we are very happy being neither and both. - The Broad is planning regular open caption screenings due to the audience demand since making the initial event announcement. Do you both believe that this will spread throughout the local community of theater owners? What can moviegoers do to push this along? MK: Thursday night was a success! I hope others like AMC, Regal, and Cinemas see how OC (open captioning) can allow Deaf people to enjoy just like everyone else on a regular basis. CP: The Broad Theater has been simply amazing. I mean all of this really started with a simple Tweet: “are you showing A Quiet Place? Would you be interested in hosting an open caption screening?” That was all it took. Michael messaged me back and said they were interested and would be back in touch about it. Before I knew it, it was official. I hope open caption screenings will spread throughout the community. We personally hope to partner with more locations throughout Lafayette, Shreveport, and Baton Rouge to make more OC screenings possible; but I don’t believe it will happen as quickly as people would like. One of the perks of the Broad Theater is that they are locally owned and managed - there is no corporate or overhead for a special event besides the local owner; because of this, it took less than two hours for the event to be solidified. With larger megaplexes or chain theaters you have to contact corporate who has to contact PR or whatever to see if this is a “good move.” To us, and thankfully the Broad this is an amazing move - and I think it really showed. - What kind of feedback or audience stories do you have from putting on these inclusive showtimes? MD: Anytime we get to invite people to the theater who haven't been there before it feels less like work and more like a calling. We want as many people as possible to enjoy a night at the movies and the response we get for all of our special screenings is nothing less than pure joy. It's a great feeling.